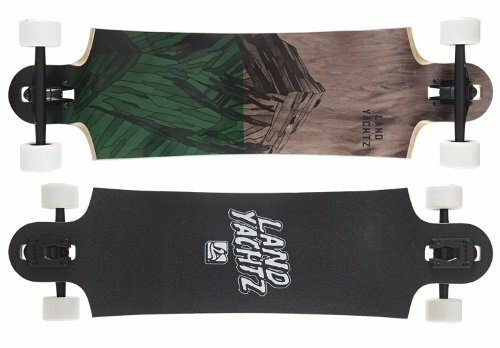 The Landyachtz Switchblade has been around for over a decade, yet it remains a highly regarded longboard for freeride and fast downhill riding, as well as for comfortable all-around transportation. 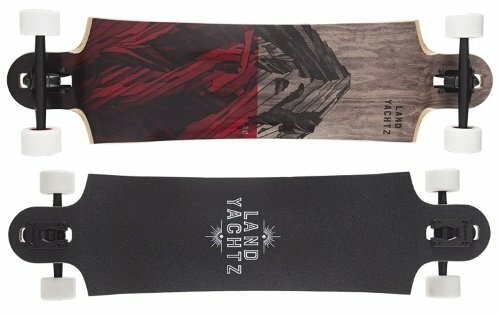 What is the Landyachtz Switchblade good at? It’s a super stable board at higher speed thanks to its large standing platform, double-drop construction, lowered platform, and affirmed concave for secure foot lock-in. Despite its high stability, the Switchblade is a responsive freeride board great for learning to slide, as well as a capable long-distance push commuter. It’s one of the most durable boards on the market. The Switchblade comes in three sizes, a 40″ version, a 38″ version, and a 36″ version (Amazon links). The Switchblade is a solid and stiff, 9-ply maple wood deck with a fully symmetrical shape and huge wheel cutouts for ample wheel clearance. An exception to the full maple construction is the pricier “Hollowtech” version of the Switchblade built using Landyachtz’s special technology. This construction results in a hollow core deck that’s astonishingly lightweight and is transparent in the light! The Switchblade has a drop-through construction with the trucks mounted across the deck’s “wingtips” – the baseplate sits above the deck while the hanger sits below it. The deck is also dropped, meaning the standing platform sits lower than the level of the truck mounts, which makes it a “double-drop” deck (since it also has a drop-through mount). Unlike other dropped decks, the drop is not vertical but slanted, allowing you to tuck your feet against it. Another key complementary aspect of the deck’s shape is the prominent W concave which creates two deep pockets between each truck mount and the middle section of the deck. So while the standing platform is globally lower than the truck mounts, the deep pockets at each end of the platform make are even lower to the ground than the midsection, cuddling your feet in a secure lock-in. The drop-through mount and carefully engineered foot pockets make for a significantly reduced distance to the ground and hence a very stable, comfortable, and secure ride. Again, the main impression from riding the Switchblade is one of sheer stability and security when going fast, due to the lowerd center of gravity. The board is also surprisingly responsive and maneuverable at higher speed given its sheer size and wheelbase – even the 40″ version. The turny and carvy Grizzly Bear trucks make the board lively. The slanted dropped shape give you good leverage over the trucks, noticeable better than with a classic vertical drop. Due to the large wheel cutouts, you never experience wheelbite including when doing tight carves on a bigger slope – even with the big 70mm wheels the board comes stock with (see setup section). Breaking into slides is easy due to the lower ride and gravity center. Learning to slide on the Switchblade is greatly facilitated by the secure feel provided by the deep foot pockets and the raised rails. The foot lock-in, the great stability, the responsive turning all combine to give you the confidence to push the board out sideways by pressing on the uplifted edges and shifting your weight off the board while facing downhill. 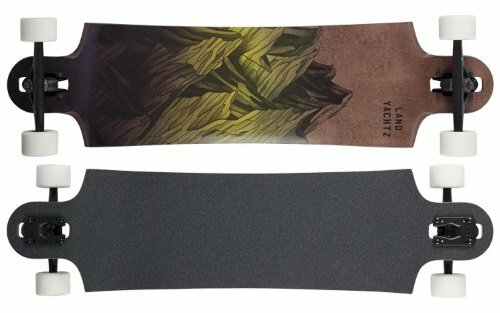 The Switchblade is truly an excellent board for a beginner freerider to build his/her sliding skills on. The symmetrical shape also makes switch riding and 180º slides easier. The absence of kicks, however, prevents more sophisticated freeride tricks. It’s also a capable downhill board, again thanks to its outstanding stability at high speed and its uber-secure concave. The responsiveness in turns also makes it suitable for high-speed corners. 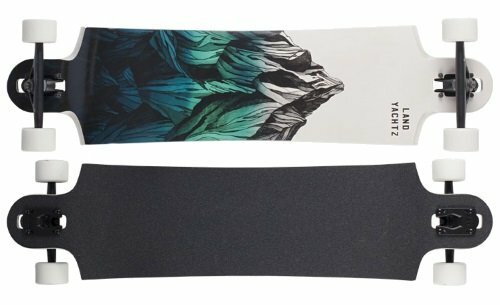 Pre-drifting is easy on this board – although you probably won’t hold as tight and clean lines as on a topmount speed board. The Landyachtz Switchblade is suitable for distance pushing and commuting, being a stable low-riding longboard. The large wheelbase makes it comfortable for kick-pushing over long durations. The only caveat is the strong concave and foot pockets which lock you feet in specific positions, hindering your ability to adjust your position when pushing. While the Switchblade is a good downhill carver thanks to its maneuverable and lively ride, here again, many riders feel that the deep W concave sometimes restricts the foot movement in a negative way, e.g. when pumping which requires constant foot adjustments. Also, while the big cutouts offer high wheel clearance for doing tight carves, the very low foot pockets may sometimes scrape the ground e.g. when encountering small terrain bumps in hard turns. The Switchblade comes with Bear Grizzly GR852 trucks which are extremely smooth, responsive and carvy trucks. The 852s play a key role in the Switchblade’s overall responsiveness and high maneuverability in spite of its size and weight. I’ve used the GR852 for months and really love the way they feel (see my review of the Landyachtz Chief pintail for more details). The Switchblade in all three sizes ships with 70mm Mini Zombie Hawgs wheels (80A duro). The Mini Zombies are good round lipped wheels with an offset core. Despite being relative soft for smooth rolling on all kinds of terrain, these wheels break traction easily and offer a smooth slide and predictable hook-up. 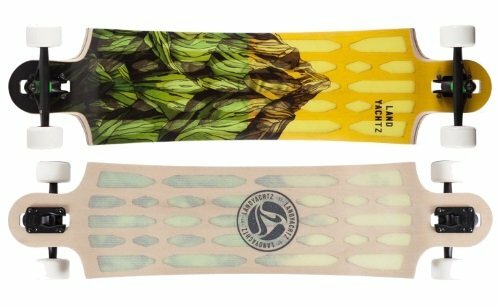 They are very suitable for learning to slide, and are quite durable (less prone to flatspots). The Bear Spaceball bearings that come with the Mini Zombies have built-in spacers, which helps preserve the Grizzly trucks for premature damage when learning to slide. Note: the Bear and Hawgs brands are owned by Landyachtz, which guarantees the quality of the components included in the Landyachtz setups. 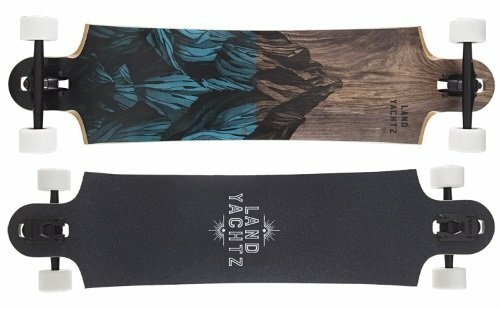 The Landyachtz Switchblade is a highly reliable and durable board that will help you get into freeride or downhill by offering you comfort, stability and security without losing maneuverability. A low-riding longboard, the Switchblade is also suitable for long-distance pushing and commuting provided you get used to the aggressive concave. 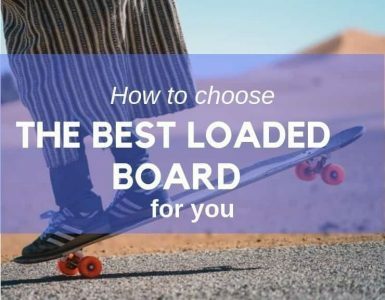 The quality stock setup that ships with the complete also contributes to making this board smooth rolling and fast turning, both on flat land and hills. You can pick the right size Switchblade for your height, weight, and personal riding goals. You can also opt for the Hollowtech version for a more lightweight and portable board. Without a doubt, after all these years, the Switchblade is still great value for money.